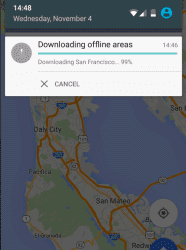 Google Maps has a really cool mobile app for Android and iOS, but most of its features aren’t available when you’re offline. You can cache maps for small regions and that’s pretty useful, but what if you want to cache the maps for an entire country or use navigation and driving directions when you’re in a different country? The Here app offers this feature for free and now you can use it in Google Maps too. “Now you can download an area of the world to your phone, and the next time you find there’s no connectivity — whether it’s a country road or an underground parking garage — Google Maps will continue to work seamlessly. Whereas before you could simply view an area of the map offline, now you can get turn-by-turn driving directions, search for specific destinations, and find useful information about places, like hours of operation, contact information or ratings,” mentions Google. The new feature is gradually rolling out in the latest version of Google Maps for Android and it will soon be added to the iOS app. 6 years after launching turn-by-turn navigation, this feature works offline and Google Maps can finally replace paid navigation apps.